After a long and dreadfully hot summer for most of the United States (with wildfires aplenty), it seems like things are finally starting to cool down. Here in New Jersey, we definitely experience our fair share of the winter accompanied by single-digit temperatures that make it impossible to get out of bed in the morning. So, with summer in the dust and winter still a few months away, we’re ready to let the prime temperatures and unspeakably gorgeous color change take place. Now that the evenings aren’t so warm anymore and there’s that slight, chill early fall breeze in the air, soaking in a hot tub from our Maple Shade Bullfrog home spa dealers feels better than ever. Sure, there’s nothing wrong with taking a dip even when it’s still warm outside, but let’s admit: hot tubbing is better when it’s a little colder outside. If you’re as excited about the seasonal transition as we are, you’ll enjoy these great reasons why fall is, to many, the best season of the year. For those in the market for a Bullfrog home spa, feel free to check out our guide to finding the right Bullfrog hot tub. Tired of the muggy, humid, suffocatingly-hot summer air? Every fall season brings refreshing breezes and air that you can actually breathe in and feel like you’re truly “getting a breath of fresh air.” We don’t envy those who live in the south and don’t get this incredible, chill fall air. Summer is a fun, active time of year, but at the expense of sweat and feeling like you’re going to collapse of heat exhaustion regardless of what you’re wearing. Here’s the thing with hot vs cold weather: you can’t rip off your own skin or be naked to escape the heat (medically and legally speaking), but you can put on more warm clothes to escape the bitter cold. In the case of fall, a light jacket or a flannel shirt is the ideal clothing choice to stay comfortable. Outfit-wise, it doesn’t really get much better than that. You can sip a hot coffee in the summer heat, but are you really going to enjoy it as much as when you’re a little cold in the morning? Hot beverages literally warm us from the inside out when it’s chilly outside, allowing us to take a step back and appreciate the small things in life. We like the four robust and distinct seasons that New Jersey experiences every year. There’s never an “ugly” time of year perse, but it’s widely agreed upon that fall is, unequivocally, the most beautiful time of year. With the color change of the leaves, and that satisfying crunching noise that they make when you’re walking on them, it’s just hard to beat the aesthetic qualities of fall. Stop By Our Bullfrog Home Spa Dealers In New Jersey Today! 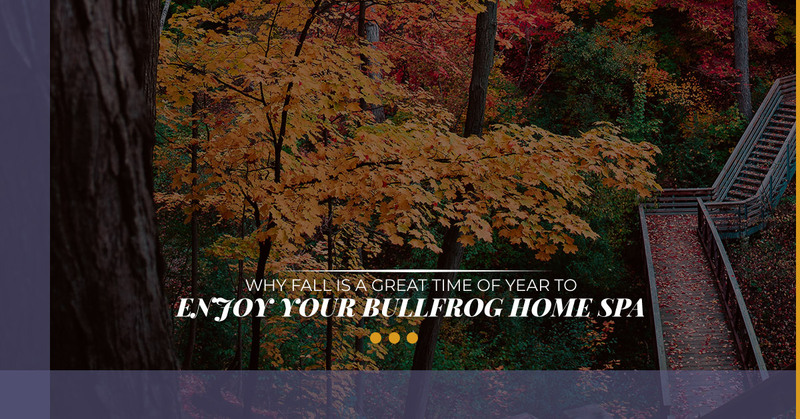 Take advantage of the changing seasons and treat yourself to a Bullfrog home spa experience that you won’t soon forget. Contact Spa Hearth & Home here! Shop Our Bullfrog Hot Tubs Today!